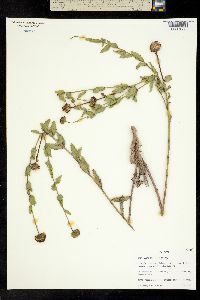 Perennials, 50-120(-200) cm. 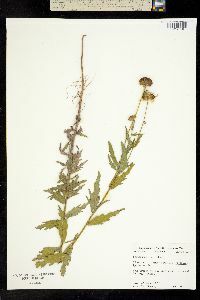 Stems erect, usually strigose or hispid to glabrate. 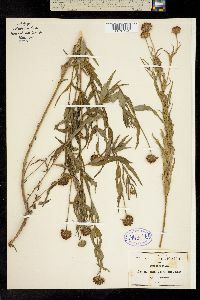 Leaves cauline; opposite or alternate; sessile; blades (green or grayish, 1- or 3-nerved) lanceolate, 5-9 × 0.5-3.5 cm, bases ± cuneate, margins entire or irregularly toothed to lobed, faces strigose to strumose, gland-dotted (adaxial sometimes glaucous). Heads 1-9. Peduncles 4-13 cm. Involucres hemispheric, 10-24 mm diam. Phyllaries 16-21, lanceolate, 6-7.5 × 1.8-2.5 mm (often subequal), (margins ciliate) apices acute, abaxial faces hispidulous or strigose to glabrate, gland-dotted. Paleae 7-7.8 mm, entire or 3-toothed (apices obtuse to acute, hispid-ciliate to glabrate). Ray florets 14-20; laminae ca. 8-11 mm. Disc florets 40+; corollas 4.8-5.8 mm, lobes reddish; anthers purplish, appendages reddish (style branches yellow). Cypselae 2.7-3.5 mm, glabrate; pappi of 2(-3) aristate scales 1.4-2.5 mm. 2n = 34. Flowering summer-fall. Open, dry, alkaline soils; 1000-1200 m; N.Mex., Tex. ; Mexico. Helianthus laciniatus reaches the northern extent of its range in New Mexico and Texas; it is relatively common in the Chihuahuan Desert areas of Mexico. 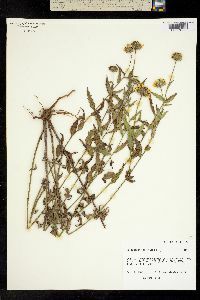 It is similar to H. ciliaris; it usually has hairy stems as well as denser leaf indument that includes a greater number of subsessile, glandular hairs.